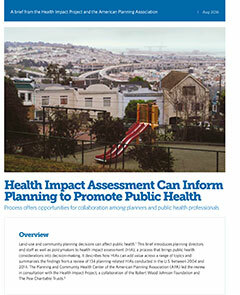 APA's Planning and Community Health Center led a project to further the education, training, and development of Health Impact Assessments (HIA) as an integral part of planning practice. 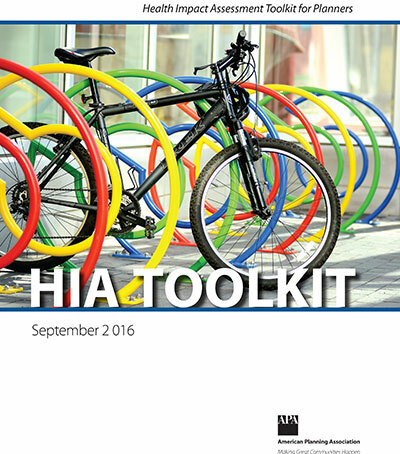 This toolkit provides guidance for planners on how to move from "considering an HIA" to conducting an HIA that makes sense given the context of the community and plan, project, or policy that the HIA will assess. This report provides an overview of HIAs in planning, a description of the HIA process, and snapshots from an in-depth study of 27 planning HIAs. We conclude with five case studies that demonstrate the diversity of planning HIAs, highlight effective strategies for conducting HIA, and share lessons learned from the process. 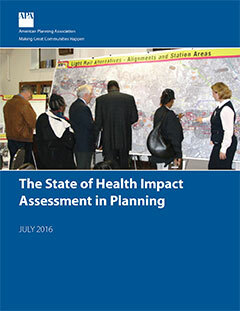 This brief introduces planning directors and staff as well as policymakers to health impact assessment (HIA), a process that brings public health considerations into decision-making and offers opportunities for collaboration among planners and public health professionals. This work is supported by a grant from the Health Impact Project, a collaboration of the Robert Wood Johnson Foundation and The Pew Charitable Trusts, designed to promote the use of HIAs as a decision-making tool for policymakers. The views expressed are those of the author(s) and do not necessarily reflect the views of the Health Impact Project, The Pew Charitable Trusts, or the Robert Wood Johnson Foundation.